1-Seoul, 2-Busan, 3-Jeju, 4-Gyeonggi, 5-Gangwon, 6-Gyeongsang, 7-Jeolla, 8-Chungcheong. Outdoor rock climbing walls in Seoul – where are they? The winter in Seoul is almost over. I can feel it in the air. It gets warmer, days are longer, and the spring flowers start to bloom. That also means, that the outdoor climbing season will soon begin. Finally! However, it’s still too windy to go to the mountain in April. But there are many artificial outdoor climbing walls in the city. Have you tried them out yet? I’ve been to two of them: Danggogae park and Eungbongsan. For me, these are best locations to meet and greet Korean rock climbers. Why to go to artifical rock climbing walls? There are not so many options to survive the winter in Seoul for rock climbers. I mean, while boulder gyms seem to be easy to find, in door rock climbing walls can rarely be found in the city. Currently only the Dyno Wall and K2 are on the list. And unfortunately, K2 gym will be closed forever from 2019 February 28th 😭. However, if you don’t mind to go to Incheon, I have another good option for you: the Discovery Climbing Square (DCS ICN). How to find the gym? 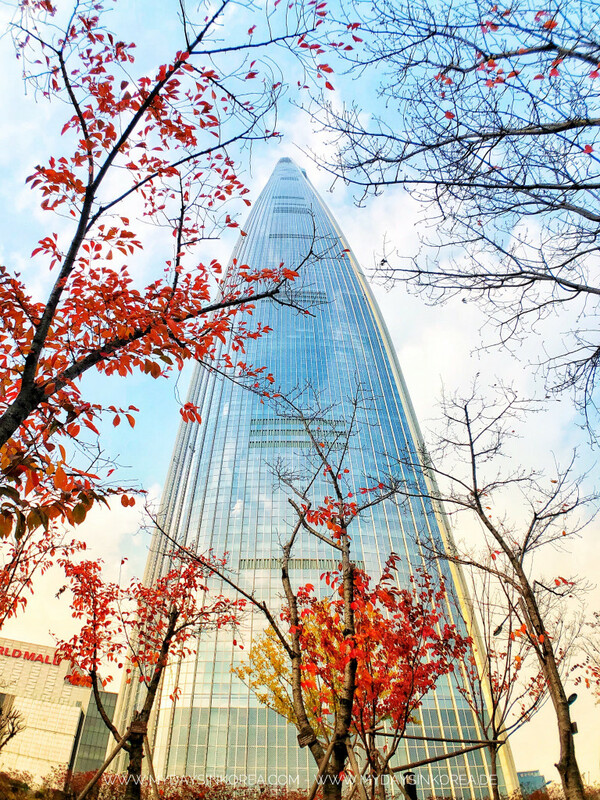 The Lotte World Tower is location on the south side of the Han river but you can see it from almost everywhere in Seoul. Because this is the highest building in Korea and the 5th tallest (2018) in the world. Have you heard that more than 60% the entire surface of South-Korea are mountains? No wonder, that there are so many hikers, rock climbers and mountain lovers in this country. During the last months, I had many chances to go hiking and climbing, because the weather was just right for it. On my trips, I could not only enjoy the stunning landscape of Korean mountains, but also gain a lot of new experiences and knowledges about Korea. Each step was worthy! 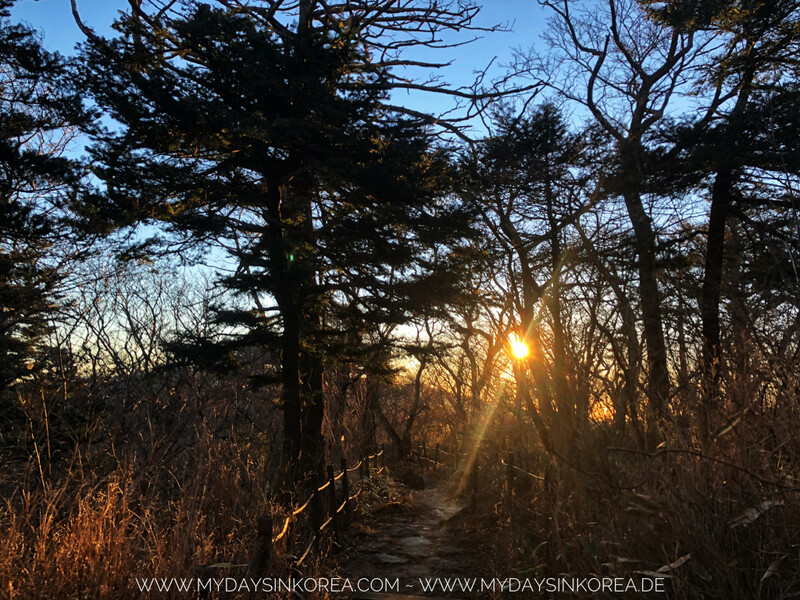 If you’re also interested in hiking in South-Korea, please read this post. It’s a guide for your orientation while preparing for your trip. After the first cold and windy hike on the first day, we could luckily rest and sleep well at Yeonhacheon Shelter. The plan for today was only to reach Jangtomok Shelter, which is approximately 13km away. However, we thought, if we‘d reach the Jangtomok Shelter as early as Yeonhacheon, we should then hike to Cheonwangbong Peak. Well… why not! 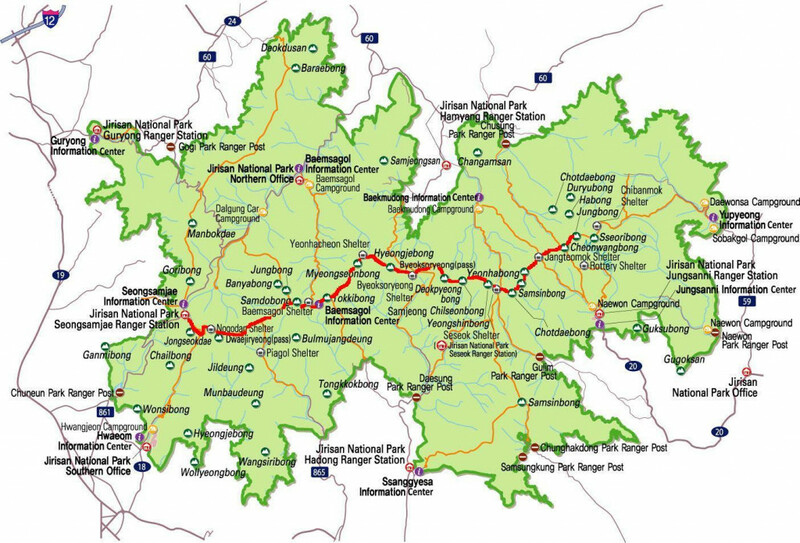 That means: starting from Yeonhacheon Shelter → Byeoksoreong Shelter → Seseok Shelter → Jangtomeok Shelter – ~13km, then from Jangtomok Shelter → Cheonwangbong Spitze → Jangtomok Shelter – ~3,5km on the same day. We woke up at 6 am in the dawn after a long rest. It was still cold. We prepared our “Gourmet breakfast” with rice and porridge, made some coffee, filled the water balloon and thermos, then hit the road with the first sunshine.